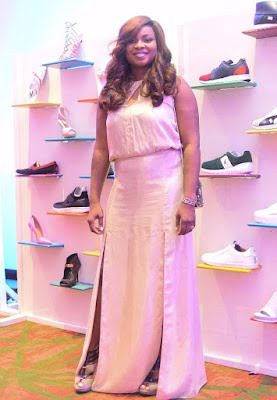 Lagos based business woman and fashion buff, Elvi Kioupouroglou was full of excitement last Sunday, when she had a great outing, at her annual show titled: ‘my shoes sip & shop party’ at one of the event halls in Eko Hotel, Lagos. On display for her shoe exhibition, was an exotic range of classy, posh shoes from different top designers across the globe. And to sip and shop that particular evening, were top society ladies among them Ex First Lady of Lagos state Dame Abimbola Fashola, Chief Mrs. Florence Ita Giwa, top business women and men who were there with their wives, Nollywood screen idols among them Kate Henshaw and Omotola Jolade, popular comedian Basket Mouth, and a host of others. 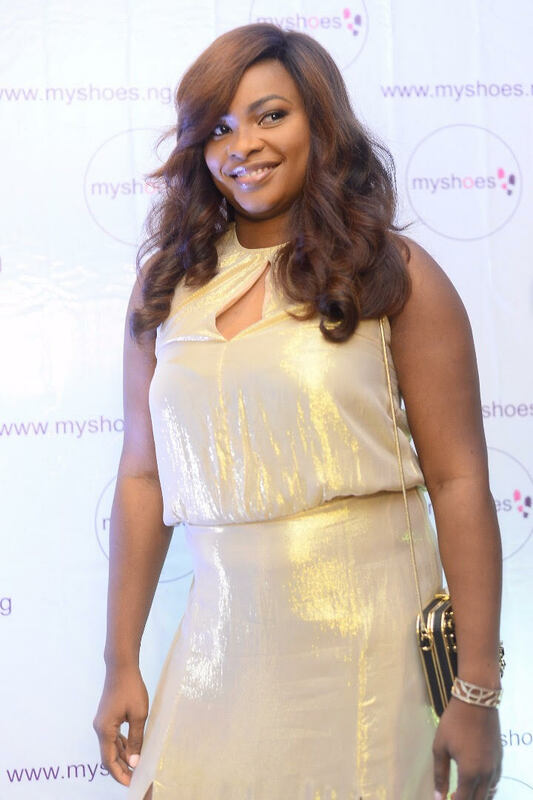 Elvi Kioupouroglou who is happily married to a high flying executive on the island, in this interview with Paul Ukpabio, tells us how she combines managing her home as a working mother, and what it takes to run ‘myworkshoes,’ her leading online portal, that caters to women shoe styles. Few days back, you had an exhibition at Eko Hotel in Lagos, what was the event about? It’s an opportunity to meet with our customers in a relaxed atmosphere, showcase our new stock and sell off at discounted prices. Do you do such regularly, or was it a one off thing? We host one ' Sip and Shop party’ every year. How long have you been in the shoe business and how has it been over the years? We’ve been in the business for 8 years. And it has been good. You sell online, what has the experience been for you? The experience is getting better and easier. We are grateful to the success of other big online merchants in Nigeria who have made it easier for Nigerians to have confidence in online shopping. Online seems to be the in-stuff these days, what can you say about this? Times have changed. We have to keep up with the times as technology is the future. We met the high class and top society ladies at your event, are your products exclusive to them? Everyone loves originality. No, my products are not exclusive to ‘Top Society’. Which would you regard as your cheap shoes and the ones that are expensive? I would rather say that cheap and expensive are relative. How expensive are your products, and are your products meant for every woman? Yes, my products are meant for every woman. When and where was the first time that you saw the most expensive shoe you ever wanted to have? That was in Milan, in the year 2009. We have met a lady who had over 200 shoes in her kitty, how many shoes do you recommend that a lady should have? A lady should have as many as her wallet can afford, as long as she has a healthy spending habit in comparison to her wallet. If you are to describe yourselves what would you say? I love originality. And I know love the art of well-crafted shoes. Would you say your early life influenced the person that you are today? I always read about Hollywood growing up. That was what influenced my interest in Fashion. While growing up, who would you say influenced you most? My Dad influenced me most. Tell us about some of your fond memories of childhood? I was a bit of a Tomboy. And that should tell you a lot. I studied BSc in Human Anatomy. It was my keen interest in Hollywood lifestyle that led me to shoe business. There’s a world of art in fashion that is involved in shoe making and business. How relevant is shoes to today’s woman? Good shoes can make a good impression. Can you enlighten us about some of the materials that make up shoes that you sell? They are mainly leather and a professional silhouette/outline/shape. What has colours got to do with shoes? I think sticking to primary colours is most appropriate. That works for me. We have a varied range of brands. How about stock, how large is your stocks? Our lowest stock at any point is 500 pieces. If you are to advice Nigerian women on how to take care of their shoes and feet, what would you say? Never wear tight shoes. Do not walk in heels you cannot manage. Avoid fake high heeled shoes as you may injure your ankles. What future do you hope for and also for the Nigerian Woman? I hope we have a future where we stop buying fake shoes. Tell us about a normal day with you, what do you do, and then on weekends too? On a normal day I work and also take care of my children. At weekends, I take care of my home. How do you catch your fun, hobbies, sports? Fun is in outings with friends, hobbies and sports for me is Tennis. Success to me is getting to a level of business that we are confident and anxious for nothing. Life as a woman in business: what advice would you give to women aspiring to be like you? Women should believe in themselves. A woman has to work very hard, and learn from her previous mistakes. If you fail, try again. For you what is married life like? My marriage is a loving-friendship relationship and we have a strong will to uplift each other for as long as we live. Do you have time for the family, considering the demands and nature of your business which involves travelling? My business does not require traveling as such. What do you consider the secret of marriage success? It is faith, willingness by both parties to make it succeed and mutual respect. As a successful lady, do you still find time to do lady’s things like cook and so on? Is fashion of yesteryears different from today’s fashion? What is your style, what kinds of clothes do you like wearing? I love clothes that show feminine silhouette. What determines the clothes you wear in a day? That is determined by the events and weather condition. What fashion accessories will you not do without? I cannot do without my earrings? If you were not what you are now, what else would you have loved to be? I would have loved to be a pediatrician. How do you spend your holiday and your most memorable holiday or travel? I always spend my holidays outside Nigeria with my kids. Every moment is memorable. Tell us about some of the countries you shop for your materials, and the peculiar things you like about those places. I shop at Italy, Greece, France, America and Spain. There are slight differences in the style in each of these places, because of their culture.